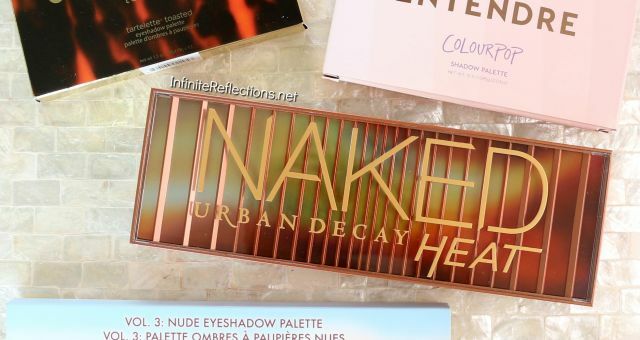 I had recently included this palette in an anti-haul video on my YouTube channel that’s because I was scared of the price tag it would carry, specially here in Singapore where brands which are not officially available tend to get very expensive. But, luckily I managed to get it at a price I was ready to pay for it. 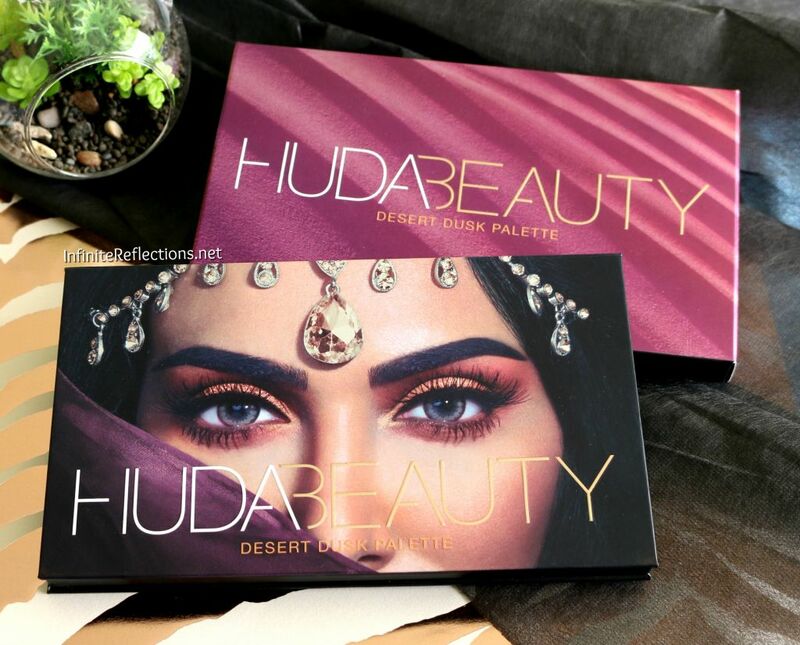 Adventure on an exotic Arabian journey with the latest eyeshadow palette by Huda Beauty. 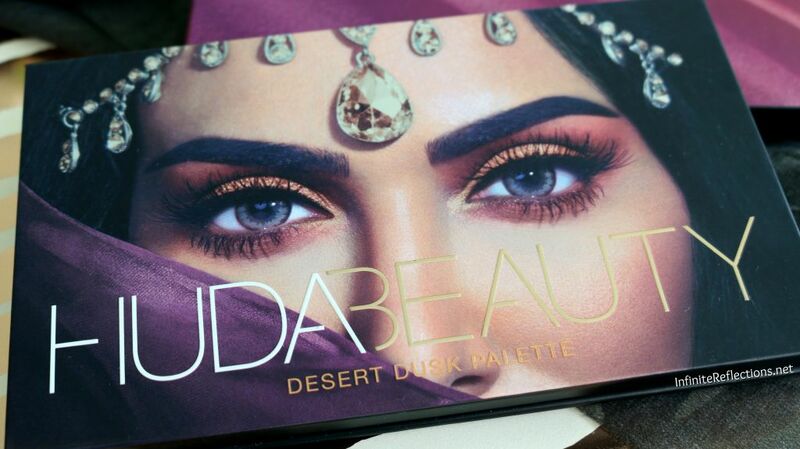 Rarely, I get attracted to products just because of their packaging but the packaging of the Desert Dusk palette is absolutely hypnotizing. 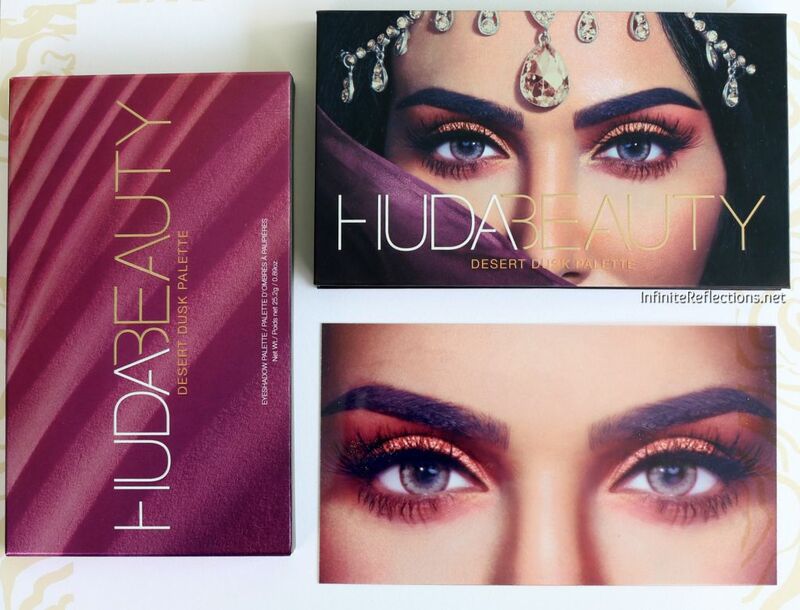 Those gorgeous eyes peeking through, what appears to be a veil, and the reflective jewels on the palette, all make for a stunning packaging. 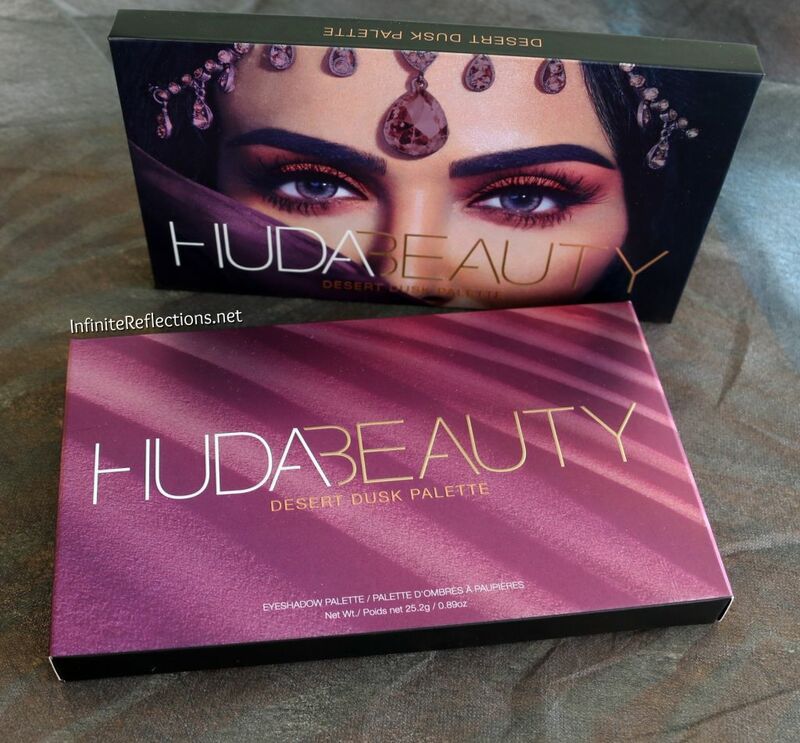 Compared to the packaging of the Rose Gold palette, it does seem like there has been a major upgrade in the whole look of this palette, since the last product received a lot of flak because of it’s packaging. Needless to say, I love everything about the packaging (it’s purple after all, LOL) and it didn’t disappoint me. The palette is a standard cardboard packaging but it feels very sturdy, it has a bit of a weight to it as well. It comes with a very good sized mirror, which makes it quite travel friendly. The palette also has an equally stunning protector inside, which is something quite unique I have seen. I have pictures below. Overall, the packaging gets a big thumbs up from me. There are 18 shadows in this palette and the Net Wt. is 25.2. r / 0.89 Oz, which makes every shadow 1.4 g / 0.05 Oz. 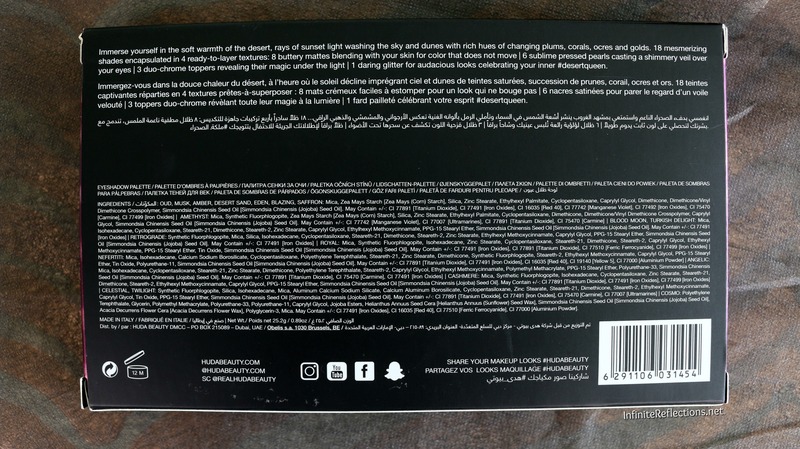 Here you can see the ingredients of the eyeshadows. 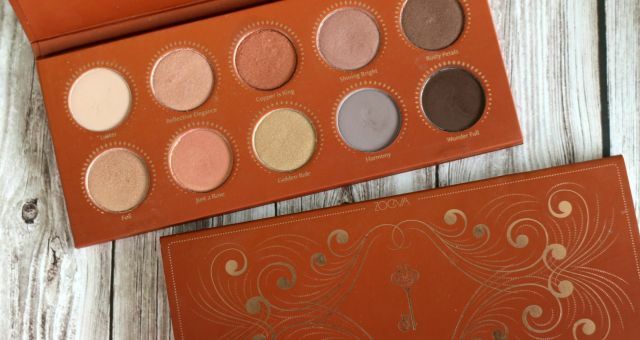 This palette doesn’t mention anything about being cruelty free or vegan. 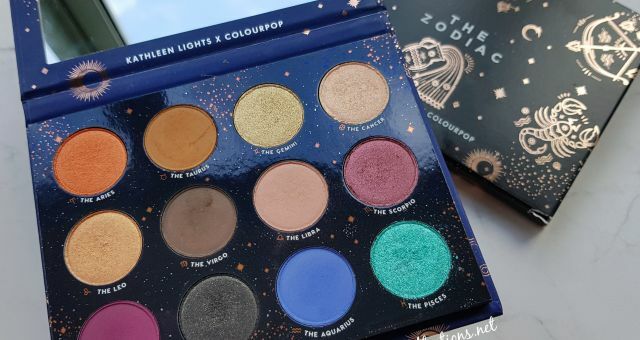 I purchased this palette from CultBeauty and I paid 46.67 GBP (Price after deducting UK Taxes), which is around 83 SGD. This is still very expensive but at least it’s not above 100 dollars, which is what most resellers are charging for this palette here in Singapore. This palette has 18 eyeshadows with 8 matte shades, 6 pressed pearls, 3 duo-chrome toppers and 1 pressed glitter. Now, here are my thoughts on this palette. 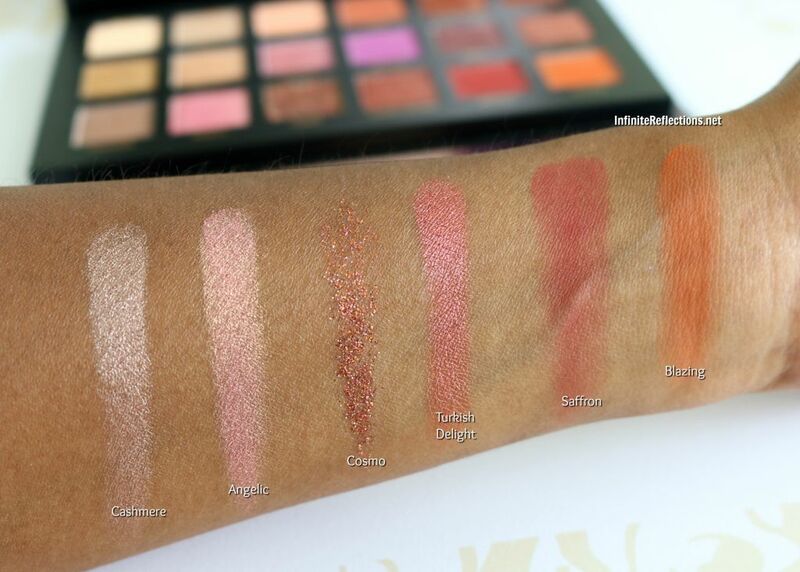 Mattes : For the most part the mattes are really good in this palette. Desert Sand, Musk, Eden, Oud feel buttery smooth and blend effortlessly and are very nicely pigmented. 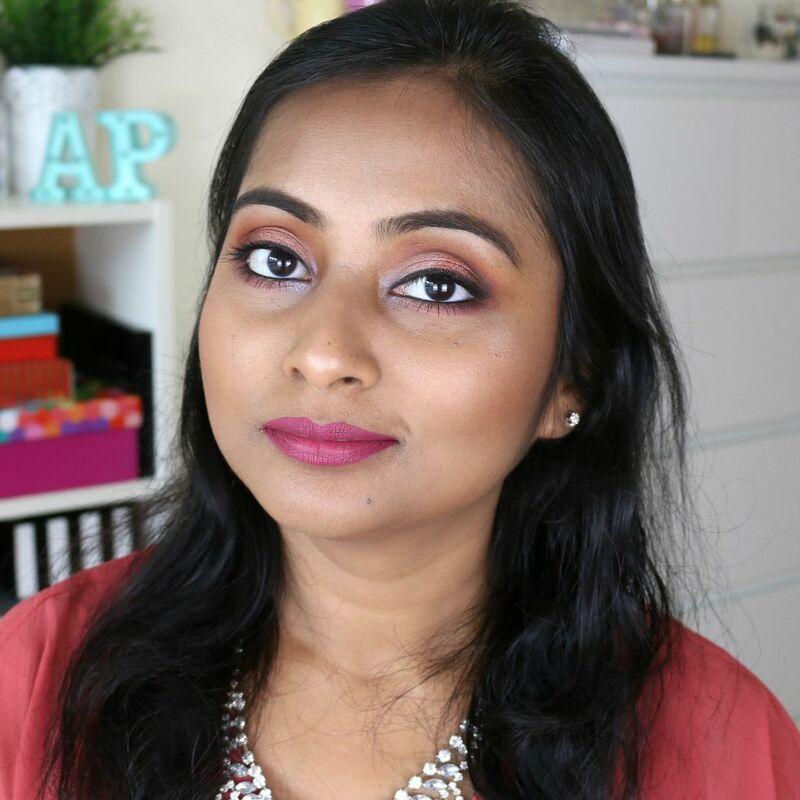 The shades Amber, Saffron and Blazing don’t feel very creamy in the pan but they work great on the eyes. The pigmentation is good and although they don’t have intense pigmentation, they can be built easily and blend well on the eyes lids. However, the beautiful purple shade, Amethyst, is a bit disappointing. It lacks pigmentation and is not as vibrant as it seems in the pan. You really have to build up this colour on the eyelids specially on my skin tone. It might work well on medium to fair skin tones. Pressed Pearls : These shades are equivalent to metallic shades in my opinion. One word – Stunning! 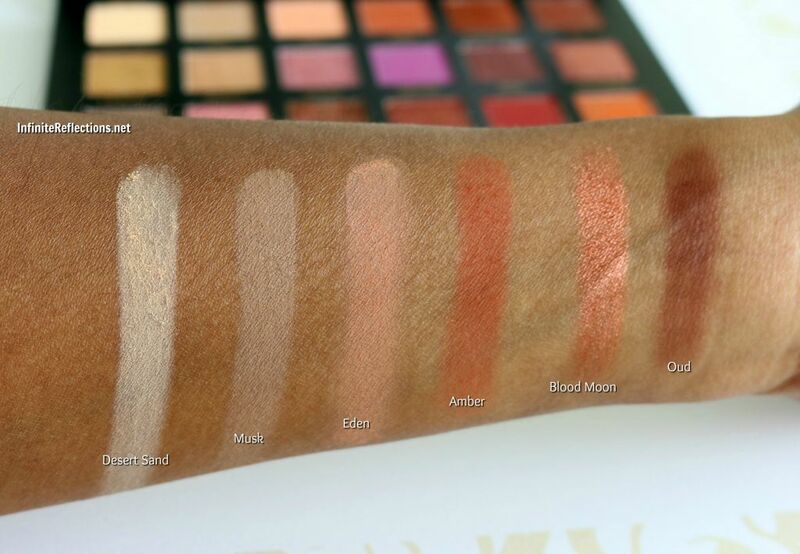 I think these 6 shades are the highlights of this palette. They are very richly pigmented and give a very high shine metallic look. 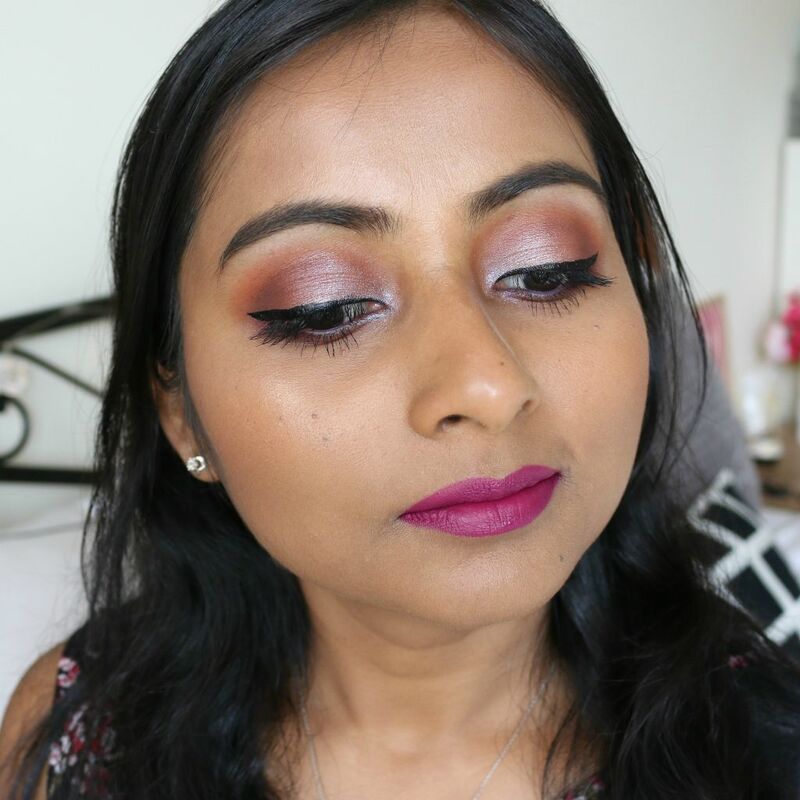 The shades Blood Moon, Royal and Turkish Delight are a treat to work with since they are just so smooth and richly pigmented. The colours look very vibrant on the eyes. The other three shades Nefertiti, Cashmere and Angelic are also really intense and have excellent pigmentation but they feel a little bit powdery but they can be blended to a smooth finish on the eye lids. 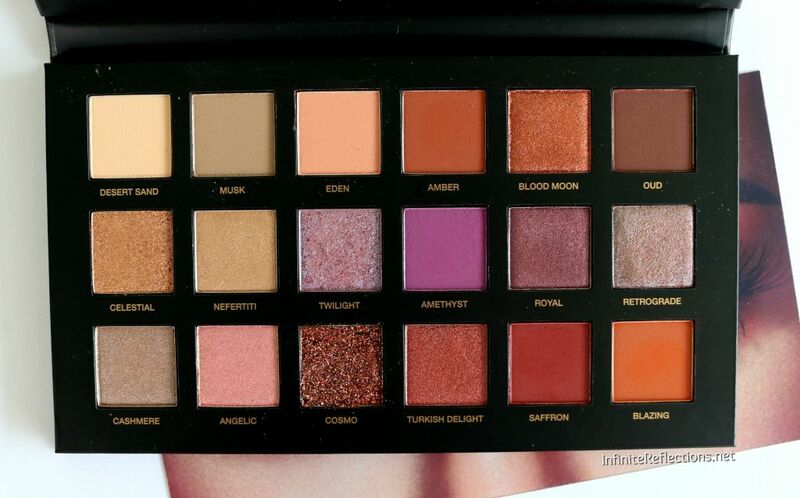 All the 6 shades are absolutely gorgeous. Duo-Chrome : The duo-chrome shades are also very beautiful in this palette. The shades Celestial and Twilight are very smooth, pigmented and have a very noticeable duo-chrome shift. They work well on the eye lids as well. As for the third shade, Retrograde, it feels a little bit chunky in the pan and is not as smooth as the other duo-chromes. This shade does need to be worked at a little bit more than the other shades. I think this one will look best applied on a base eyeshadow such as a black or other deep shades. This one also has a very pretty purple silvery bluish duo chrome shift. Pressed Glitter: The glitter shade, Cosmo, looks so beautiful but unfortunately it totally doesn’t work out for me. To start with, it was delivered to me totally lose from the palette and I somehow managed to press it back. There goes my motivation to work with this shade. I have tried to work with this on it’s own but I faced a lot of fallout, so you definitely need a glitter glue. It’s sad that only because of this shade, I will think twice or may never travel with this palette, which is so disappointing. 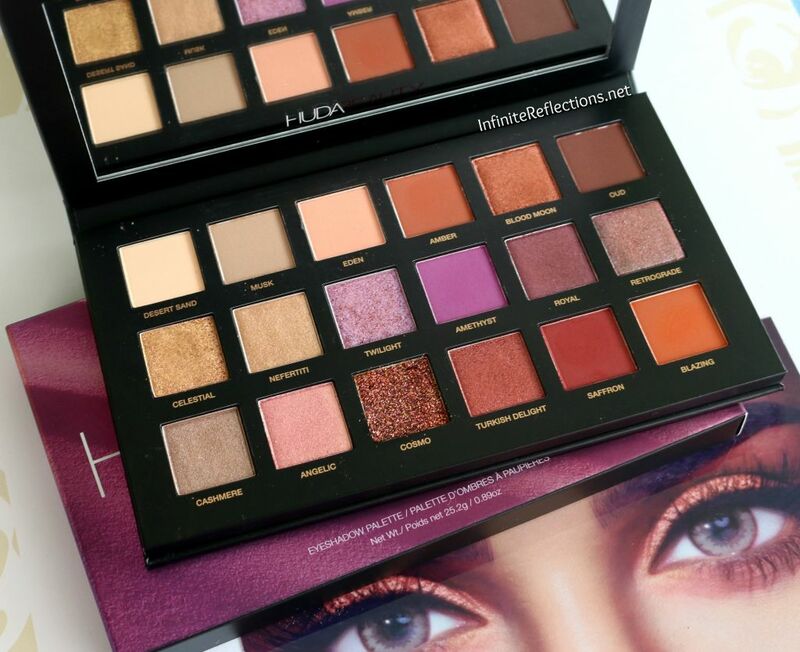 I did not notice major fallout from this palette as far as mattes are concerned. But, I did notice very minimal fallout from some of the shimmers which I have mentioned above as a tad bit powdery. The lasting powder of the shadows is really good, as claimed. I was surprised how well they lasted on my eyes even without primer, they easily lasted 5-6 hours on me. I will definitely recommend a primer to make them last longer but the performance without an eyeshadow primer was also very good. Now, let’s look at the swatches on my skin tone. Row 1: The mattes are excellent in this row but my favourite will have to be Blood Moon. 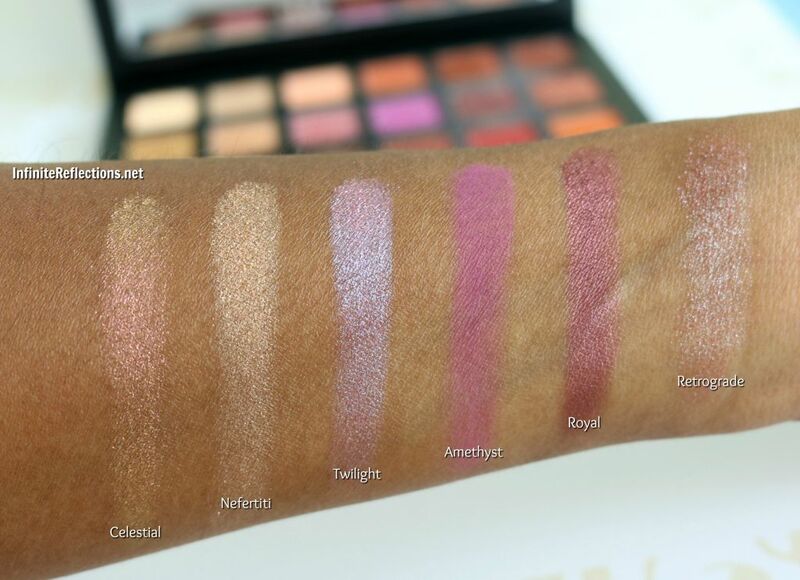 My camera couldn’t focus properly so this swatch doesn’t show how intense that shadow is. Row 2: Celestial, Twilight and Royal are definite favourites from this row. 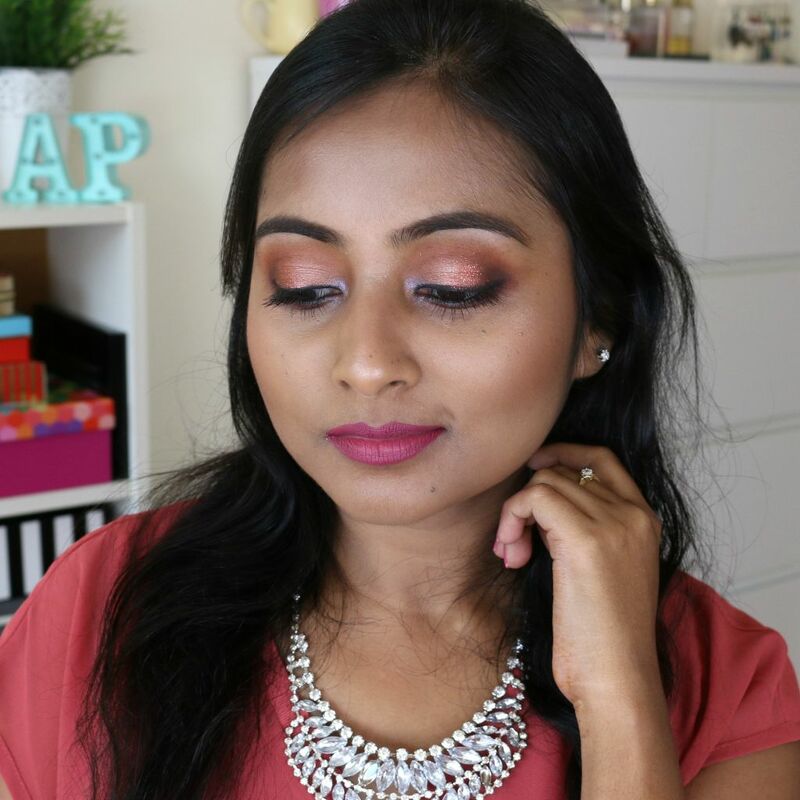 Retrograde just looks totally different and stunning over a black eyeshadow. Row 3: Very difficult to choose from this row. Except Cosmo, I love all of them. 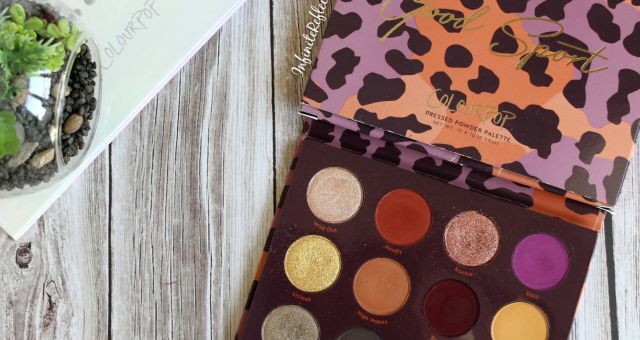 Overall, I think this is a very beautiful palette and if you are not someone over critical then you are definitely going to enjoy this palette, provided you like metallic shades because this palette has a lot of glitz and shimmer. 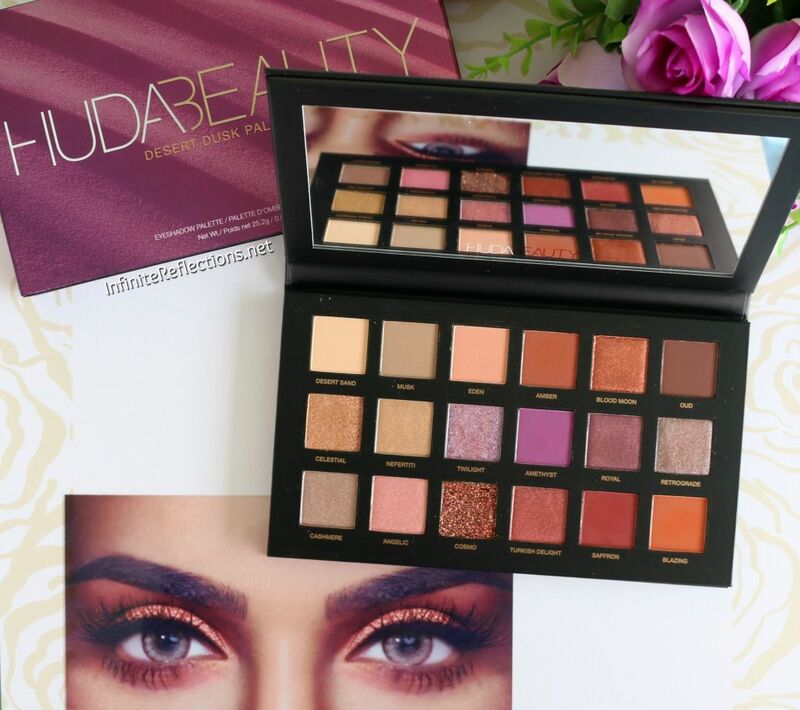 I will definitely recommend this to you if you are interested in getting this palette since you will be able to get a lot of pretty looks. That’s all for today everyone. I will end this post with some looks which I have done. 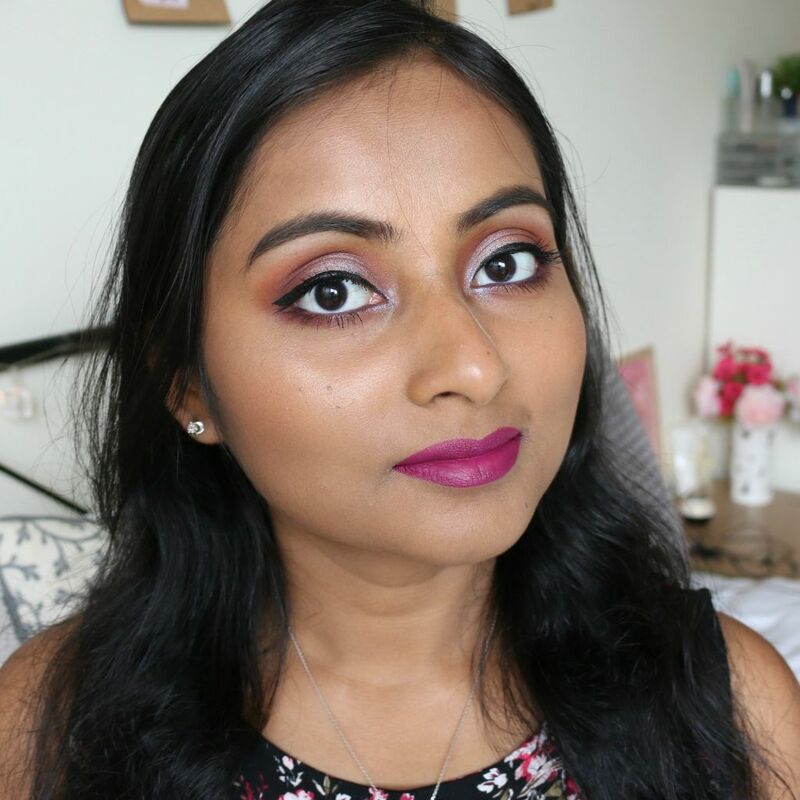 I will also link a video which I have done comparing this palette to the Coloured Raine “Queen of Hearts” Palette. ur eye look is beautiful. This palette is good. Do u know any DIY for eye primer?